A few months ago, I made a recommendation on this blog. A recommendation for a book that I hadn't, at that time, read. Anirudha Bhattacharjee and Balaji Vittal's book on '50 Classic Hindi Film Songs' aptly titled Gaata Rahe Mera Dil (HarperCollins Publishers India; Rs350). As I'd mentioned earlier, I'd read their book, 'RD Burman, The Man, The Music', which won them a well-deserved National Award, and had loved it. I was eagerly awaiting this one, my own personal autographed copy, which was being ferried to me by a friend who was coming to the US in August. So, late though it is (fellow-blogger Dustedoff has already reviewed the book here), I decided to go ahead and review the book. This is a song that has been rendered by many classical and playback singers, but even today, KL Saigal's rendition of this thumri is deservedly seen as a 'classic'. With a small note on the beginning of playback singing in Hindi films, the authors then move quickly on to their choice of 50 songs that represent the five decades from 1941 to 1992. We get two bonus songs (apart from Babul mora): the iconic Ae mere watan ke logon (which is not a playback song) and Ae ajnabi tu bhi kabhi (Dil Se/1998), which the authors added as a 'song for the new millennium'. What I really liked about the book is the attention given not just to the music directors and singers, but also to the lyricists, arrangers, and instrumentalists, all of whom are as important to the composition of the Hindi film song as the music director and the singer. It is clear that a great deal of hard work has gone into the making of this book. A great deal of blood, sweat and tears, especially where interviewing film folk was concerned. Anyone who has done the rounds knows that trying to meet anyone in film world is a thankless job where one has to make four two-hour trips just to meet someone for ten minutes. So, for them to have talked to the various musicians, composers, singers, actors, lyricists, arrangers... to have collated information from old magazines, from non-filmi sources who have spent a lifetime collecting information on the music and musicians of the golden era, to have travelled possibly the length and breadth of India to have amassed this information? That is worthy of a standing ovation. You get to read of how how music director Chitragupta met Mohammed Rafi — when they were both singers in the chorus; of how Ahmed Jan Thirakwa Khan, the famous percussionist, was so bowled over by SD Burman's rendition of Sun mere bandhu re from Sujata (1959) that he insisted on meeting the singer. When told of this by Pandit Nikhil Ghosh, who was Khan saheb's student, SD Burman came to meet the great artiste; Khansaheb gave SD a ten-rupee note, so happy he was to meet the singer who had touched his soul. These tidbits of information make the book an interesting read. The background stories, the reasons why these chosen songs have withstood the vagaries of time and taste, why they still continue to give us goosebumps when we listen to them — they make the book worth reading, and makes one wish a forlorn wish that the publishers could have presented us with an accompanying CD so one doesn't have to stop reading to go listen to one of the listed songs. The songs themselves are meticulously researched, and each song gets its own chapter — the better to describe why it deserves to be included in this eclectic, and exclusive, list — and each chapter gets its own title (more on that later). A well-designed 'framed' screenshot of the song, with the name of the song, singer(s), composer, lyricist, etc., welcomes us to the different chapters; we are also told which film, and when it released. Then comes the real meat of the narrative (and the start of a bonanza for trivia lovers): a brief context that helps us understand the situation and the song better, interesting details on why and how the song was created, what makes this particular song so special that it became representative of an age, followed by, in most cases, a musical analysis of the song. I have no compunction in stating that this is where the book lost me - I'm as ignorant of ragas and asthayis as I am of komal dha and major scales, and I certainly wouldn't know a minor chord if it walked up and introduced itself. I have no way of even saying whether the technical notes flow well, because the authors could as well have been talking Double Dutch to me. But that's okay; it's my limitation, and I don't expect the authors to cater to my ignorance. What I do take notice of, however, is when the passages that I do comprehend, are lazily edited. It's a professional handicap. I was warned about the editing before I even got my hands on the book, but I'd not expected to be as egregious as I found it. Here's an example from the chapter 'The Quintessential Bhajan' (Chapter 15). (The song is Allah tero naam, Ishar tero naam.) On page 82, is the sentence: 'Vijay Anand, who was officially neither the producer nor the director of the film, but is supposed to have ghost-directed it.' I can't believe that an editor, any professional editor, let that line pass. I read that twice before my brain comprehended that no, there wasn't anything to complete that dependent clause. Now these are editorial issues and cannot be laid at the feet of the authors. (And I understand, better than most, how difficult it is to edit one's own writing. I've made enough bloopers on my blog.) But I do have a bone to pick with their narrative style when they write (of Tere bina aag yeh chandni / Ghar aaya mera pardesi) in Chapter 3 - Grandeur in Tragedy: 'As Manna Dey's wail reaches a crescendo, Raj Kapoor turns and flees...' and later, in the same paragraph: "...but his plaintive moan lends the sequence an almost serrated chill.' Manna Dey's rendition being described as a 'wail' and a 'moan'? And what's a 'serrated chill'? It's an unfortunate choice of words there, and while I think that a really good editor would have (should have!) flagged them, it's still the authors' responsibility to initially find words that better describe a truly fantastic rendition than 'wail' and 'moan'. While the above example is, to me, the most egregious of the writing issues, the fact is that this book doesn't flow as beautifully as the book on RD Burman did. The language here is more flowery, with a liberal use of adjectives. (There is mention of a song which is described as '...a series of paintings clouded by a misty membrane, which gradually clears to reveal a riot of colours...' I'm afraid I giggled.) Again, it is something I'm guilty of in my own writing, but then I'm not a published author. If I were to publish, I would hope that a good editor would strongly rein in my outpourings of angst and wonder. As an editor myself, I would have striven to cut through the ornate flourishes, since I find that depending on the subject, stark simplicity is more elegant and makes for a better reading experience. And here's where I also have an issue with the somewhat-twee chapter titles. While some are apt, most seem to have been chosen to pun (contrived) or to be clever, and neither works very well. I would have very much preferred the songs to stand on their own - they don't need clever translations/allusions to be introduced to the average old Hindi film music lover. Apart from that, this pretension also makes it impossible to just dip into the book to look up a song - the chapters are indexed by the clever-sounding titles. Secondly, the goofs. Again, 'unforgivable' only because the authors are known for their painstakingly meticulous research, so the pretty obvious bloopers should have been, well, obvious. It is not Asha Parekh who played the young Meena Kumari in Baiju Bawra; it was Tabassum. Chalo ik baar is from Gumraah, not Humraaz. LP's first film is Chhaila Babu (1967), not Chhalia Babu. (The film's release was delayed, making Parasmani Laxmikant-Pyarelal's official debut.) Shama and Shabnam are not friends in Barsaat ki Raat. They don't even know each other, much less meet. Finally, the chapter on Guide (Chapter 25). The song(s) in the sub-heading are Mohse chhal kiye jaaye/Kya se kya ho gaya. However, through out the chapter, the song is talked about as 'Saiyyan beimaan.' Now, this is not a goof since the song can be referred to by both names. However, it was incumbent upon the authors (if not the editors) to choose one name and stick to it. Thirdly, the way the book is organised, it doesn't leave much scope for a real technical analysis of the songs. The analysis does not catch the interest of the lay reader who is unaware of the complexities of musical composition — nor cares very deeply about it; he is happy with the description of the song and context, and is thrilled to discover hitherto unknown trivia. What he is looking for is what the authors promised in their foreword: why are these 50 select songs deserving of the epithet 'classic'? And so, he looks to see if the selected songs meet the criteria stipulated by the authors: the overall feel of the song, the melody, the picturisation, the rendition, and above all, whether it passes the test of time, and of instant recall. He does not understand when a composer begins the mukhra on a pancham, and why he chose that particular note instead of a gandharv, and so, it doesn't interest him. Nor does it meet the expectations of serious music lovers who would want to know more about the notes and ragas that underline these beloved melodies, to learn about the confluence of lyrics, melody, tune, arrangement that all combine to produce that final masterpiece that touches their souls, and to compare it with what they know — to discuss, debate and analyse a little bit more, while they listen to these songs again. They aren't likely to care whether Hum Dono was called Full Boots, as long as they can deconstruct and analyse Jaidev's excellent score for the film. And because the book tries to be a bit of both, the analysis of the songs that follows the background and anecdotes (about the song, the shooting or the film) seem to come in much too abrupt a manner for the text to 'flow' well. Here, I think the problem is that the major part of the book has been written as light reading for the lay reader, so when the technical analysis comes in, and there is no attempt to explain what a major chord or minor chord is, any further exposition on the use of these terms tends to baffle the average reader. This last point is not a criticism, and I'm not saying it is a bad thing to combine light reading with an analysis of the music. In the final reckoning, we who write, do so primarily for ourselves. And if the authors felt this is how they wanted to present their selections, they have every right to do so. My reaction is from the other side(s) of this writer-editor-reader triangle: I react both as a professional editor — to me, these are, in fact, two of the most important questions that should have been asked: Whom are you writing for? What are you hoping to achieve? ; and as an average reader who is a relative ignoramus when it comes to the deeper analysis of music. This is not how we listen to songs, many of us, and so the parts of the book that deal with the analysis is either skimmed through (with most of it going over our heads; certainly, over my head) or skipped entirely. And that is a shame, because surely, a lot of thought and effort went into the deconstruction of the songs? Perhaps it should have been edited by someone with a lot more knowledge of music, so he or she could blend the trivia with the analysis in a manner that would make it easier for the target audience to comprehend. This then, is the book that I'd been waiting for. Did I enjoy reading it? Yes, indeed, I did. Was I disappointed? Yes, a little, but that has more to do with my expectations than anything else. Would I buy their next book? Yes, of course. One excellent book, and one reasonably decent one means I still have hopes that their next book will see them getting their groove back into the RD frame of mind. Perhaps, like the music directors they look up to, the authors too need to be inspired by their subject, and this wasn't it. 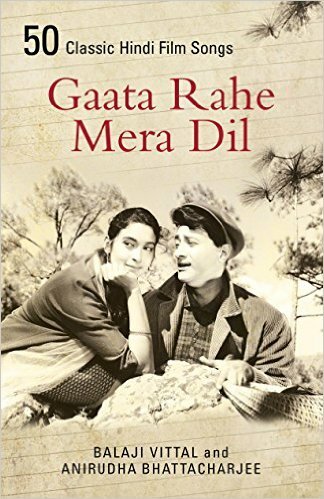 Anyone who was curious about the book would already have bought it, but on the off-chance that someone hasn't, Gaata Rahe Mera Dil is available on Flipkart and Amazon, as well as having an electronic version that can be downloaded onto an e-reader. Unlike Dorothy Parker's pithy book review (attributed, not confirmed), this book will certainly take its place next to its illustrious predecessor on my bookshelf, and I've no doubts that I will be dipping into this book at intervals (oh, how I wish the chapters were indexed by the names of the songs! ).